Discussion in 'New York Jets' started by jaxvid, Nov 7, 2005. 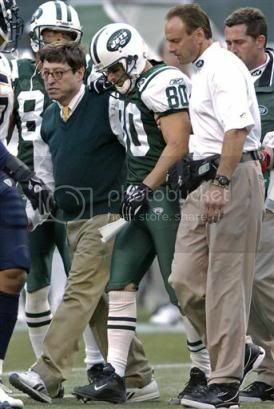 New York Jets wide receiver Wayne Chrebet (80) is helped off the field by doctor Elliott Hershman, left, and trainer David Price after suffering a concussion in the fourth quarter against the San Diego Chargers Sunday, Nov. 6, 2005 at Giants Stadium in East Rutherford, N.J. Chrebet was undergoing more tests Monday after hitting his head hard on the turf in the closing minutes against the Chargers, and it appears his career could be over. Man I sure hope not! We need guys like Chrebet out there, even if they don't get enough playing time. Chrebetwas instantly put on IR after the game Sunday, which means he's done for this year. Considering that there was speculation that he wouldn't play in '05 because of previous concussions, odds are Wayne has played his last NFL game. If so he finishes with a very impressive 581 receptions. Why is Bill Gates in that picture? Doesn't the NFL have a quota system with 4 or 5 white guys allowed to catch a few passes each year? So on the bright side of this unfortunate turn of events Chrebet's injury opens up a "white guy slot". or maybe a guy already on a roster? Good thing you didn't mention Jerheme Urban, because he's been released by Seattle for the 100th time. Meanwhile our good friends at ESPN are reporting that Chrebet is expected to announce his retirement soon. Wayne will be sorely missed as he was one of my favorite players growing up. He always got the job done and had a great career. I mean how many guys can say they have had almost 600 career receptions in the NFL. You lave to see a guy succeed from a small college like Wayne went to. Also it's funny how the Jets top 2 all time career reception leaders are white 1.Don Maynard and 2.Chrebet. The Jets should ponder that while they go through the motions the rest of the year. Chrebet is about at retirement age, he had a good career. Who will forget the whole Keyshawn Johnson "Great Lantern" farcas. That was classic! Could you please refresh my memory on the "Great Latern". Then, WhiteCB writes: "Could you please refresh my memory on the "Great Latern". You guys aren't conspiring to make this a Who's on First-style joke out of this are ya? No acutually I'm dead serious. I have no idea what this whole "Great Latern" thing is. I never followed the Jets by any means. I don't remember all the details. Keyshawn Johnson wrote a book after his first or second year called "Give Me the Damn Ball" in which he ripped into his teammate and fellow starting WR on the Jets as only being on the team because he was white and that he was head coach Richie Kotite's "mascot." I'm not sure about the "lantern" part, but Johnson kept taking shots at Chrebet even after he left the Jets for Tampa, calling himself a "star" and belittling Chrebet, so Chrebet was dubbed by some "The Flashlight" as a joke. When the Jets played in Tampa in 2000 there was a lot of media commotion about the two playing against each other. Chrebet was the hero, catching a last second touchdown pass from Curtis Martin (! ), and Johnson was shut up -- for about 2 seconds as the many Keyshawn types playing today are incapable of feeling shame or modesty. i was living in new york during the chrebet-johnson era when parcells was taking the jets to the AFC championship. johnson must have exploded with anger when they made chrebet the number 1 receiver. I mistyped. I meant to say "Green Lantern." Chrebet was dubbed the "Green Latern " then a lot of Jet fans were wearing Green Lantern t-shirts. The NFL would be filled with white receivers if every coach was as fair minded as Kotitte. Even with the IA schools refusing to recruit whites, receivers like Chrebet, Samp, Urban, Elliott, Boerigter and many others from Division IAA and II and III could play in the NFL if given a chance. Remember Don Beebe? He played at Chadron State and stepped right into the nfl. Don Beebe was a stud.I was saw him catch 3 td passes against the Steelers.They sometimes called him White Rice becase he was so fast.The funny thing is that Jerry Rice in his prime couldn't come near the speed that Don had although Rice was probably the best of all time.It just goes to show that speed is overated.Beebe was as fast as they come.He dominated the Superstars Event in the 100 yard dash.I really liked to root for him as well as Chrebet. I read where Don Beebe was trying out for a couple of NFL teams and he ran three 40 yd dashes which were all hand-timed below 4.29 sec. The guy could flat out run. Wow great articles explaining the whole Green Latern extravaganza. I'm so glad Chrebet shut up that idiot Meshawn Johnson and showed him whos boss. Chrebet is the man and I even had a teacher who looked like Wayne it was pretty funny. I saw an episode of the King of Queens a few weeks back where Doug was watching a Jets game and Chrebet was making some spectacular play. You could hear the announcer talking about it and of course Doug was going crazy. Anyway, I thought it was pretty good. On another play, the announcer talked about how open Wayne Chrebet was, and the QB didn't see him and threw the ball away or tried to run and didn't get the first down, or something similar. I feel bad for my favorite player of all time. It must be very tough on Wayne. Just read the article and see what he's going through after all the concussions. Photo By John Munson / The Star-LedgerWayne Chrebet at his restaurant in Hempstead, N.Y. across from the Jets' practice facility. HEMPSTEAD, N.Y. -- It's halftime on Sunday, and the microphone stand has been positioned near midfield on the naked acre of artificial turf at Giants Stadium. More than 70,000 Jets fans are eager to cheer a brave hero who has come to receive, finally, the thanks of a franchise, but also to say the misty-eyed goodbye his cruel exit from the brutal game never allowed. Two years after his retirement, hundreds in the stands still wear his No. 80 jersey, and Wayne Chrebet -- surrounded by his wife and children, his parents, team officials and former players -- hears his name and walks slowly toward the mike. He is bear-hugged by the thunderous applause given to one of the most popular players of this era. A million things and nothing are racing through his mind at the same time. He looks around the stadium: The three packed decks are now eerily still. The fans wait and listen. And wait. And wait. Standing behind the downstairs bar at the Hempstead restaurant that bears his name, Chrebet, in a baseball cap and T-shirt, takes a deep breath, refocuses and leaps back into the present. It was just a cruel daydream. "That's my biggest fear," he says. "I know what I want to say, but I'm afraid I won't be able to remember it. My memory isn't very good. I could write it down, but I don't want to go up there and just read something. I want it to be from the heart, but I want to remember it, too. "How would you feel, talking in front of 70,000 people and everybody hanging on your words, especially with my memory?" Six documented concussions -- in all probability, he suffered twice as many in his career -- forced Chrebet, the sure-handed and fearless wide receiver, into retirement after the 2005 season. Today, the migraines and darkness still stalk him, sneaking up from behind like a cheap-shotting cornerback. And Sunday, when the Jets honor him at halftime of their game against the Miami Dolphins, Chrebet hopes the temporarily unshakable sadness won't hold him hostage. He wants the fans to see him, if not as he was, at least at his postcareer best. But he won't be sure until Sunday morning. "I have good days and bad days," Chrebet says. "A bad day is when you can't get out of bed and there's this dark cloud hanging over your head. A good day is anything else. But you know right away. I know as soon as I wake up what kind of day it'll be. "Sometimes the bad days and good days go back and forth. Sometimes you get a bunch of them in a row. It's not an exact science. The bad days happen. You just try to make the best of it. But when it's bad, it's really bad. It's not the kind of thing you can talk yourself out of. If it was, I would do it." After all, the Garfield native talked himself into the NFL, then talked himself into the Jets' starting lineup as an undersized, undrafted free agent from across the Hofstra University parking lot. And when the 11-year career, which went from a storybook to a medical journal, was over -- after all of the crossing patterns and crushing hits -- Chrebet had the second-most catches in the franchise's history, with 580 for 7,365 yards. Forty-one receptions went for touchdowns, 379 for first downs. But, like many others, he paid a price. A 2005 study by the Center for the Study of Retired Athletes said former NFL players who suffered three or more concussions are five times more likely to have cognitive problems and three times more likely to have serious memory lapses than players without a history of concussions. Another study revealed that players with three or more concussions are three times more likely to suffer from depression. The NFL, which refutes the findings, says it will spend $2 million to conduct its own study. Whatever those results, it will be too late for Chrebet, just 34 years old. Five minutes into an interview this week, he admits that he can't remember the reporter's name. "I remember the faces, not the names," he says. He loses his car keys like anyone else, "but it just happens to me more than other people." He'd like to meditate or read, but he can't concentrate enough. He can't make the drive from his home in Colts Neck, N.J., to Hempstead, or anywhere, without a navigational system. He remembers the time, after one of his final games, when he drove from the stadium to a house where he no longer lived. His wife directed him home. "If it wasn't for the GPS in my car, I'd be in trouble," Chrebet says. "If I have one of those, I'm usually fine. If not, I panic." But football is different. Sit him in front of a game with a team running the West Coast offense, and Chrebet can call out the plays before the snap. Names are a problem. Dates are a problem. Highways are a Sudoku puzzle. But offenses and defenses are a breeze. "It's like riding a bike," he says. "After hundreds of hours of watching tape, I'll never forget that. 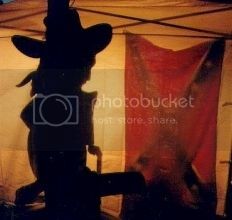 It's in my blood." The Monday night football crowd has filled Chrebet's restaurant across the street from the entrance to Hofstra University and the Jets' practice facility. The waitresses hustle from kitchen to table with plates of Chrebet's Famous Wings, the most popular item on the menu. Tonight, they're 10 cents each. With an off-day Tuesday, Jets wide receiver Laveranues Coles sits with his buddy in the first booth, just inside the front door. "He's the only reason I'm here," Coles says. Fans, on their way to the tables and flat-screen televisions in the back, stop, introduce themselves and collect an occasional autograph. They mention games and plays -- highlights, usually -- of Chrebet's career. Some he remembers, some he doesn't. But he doesn't tell them. He nods and smiles, thanks them for coming, and signs whatever they place on the table. He enjoys the interaction, because "someday they won't want my autograph. Somebody once told me that," he says. The greeting, however, is always the same: Wayne, how are you doing? "I say, 'Fine. How are you doing?'" Chrebet says. "They're happy to see me, but it's like they don't expect to see me here. They read all of the stuff about how badly I was hurt and they think the worst. But I'm okay." He is a Hail Mary pass from the college stadium and NFL practice field where he starred, but he refuses to cross Hempstead Turnpike and visit. "I don't want to be like the kid who was afraid to leave high school," Chrebet says. "They've moved on. I've moved on. Besides, who wants to see what they're missing? It still hurts. If someone said I could play again, I'd be back out there tomorrow." Instead, he spends his days with his trotters -- Southwind Tempo won six races in a row this summer -- his restaurant and his family. While his wife Amy knows to leave him alone on a bad day, his two young children, Lukas and Cade, don't always understand Daddy's funk. "They jump on you," he says. "They want to lay with you. But the whole time I'm with them, I'm thinking what a crappy day I'm having. I'm pushing them on the swing, thinking, 'Today stinks.' It's a shame.'" He can't believe the Jets are honoring him, and he won't speculate on having his jersey retired. (The Jets won't say.) He's just glad to have the chance to say goodbye: "I'm grateful for what I get," Chrebet says. He isn't bitter. "It's my own fault," he says. "I could have gone out of bounds more. I could've ducked under tackles. They told me, 'Be careful. One more concussion and you're done.' I played the same way. Whose fault is that?" As the interview ends, he wonders: "So, is this going to be a good piece or a bad piece?" What would be a bad piece? "One that makes people feel sorry for me," he says. "I'm happy. Who wouldn't trade for the career I've had? Tell them I'm happy, because I really am." I wonder if he is still feeling the sting of concussions. I know that his retirement and post career health woes are similar to Al Toon who was a Jet star receiver in the late 80's through early 90's. Yes, he still has siginficant memory loss and brain damage. I think most players who played in the NFL have some effects of the game after they retire. I always say, if you play in the league and come out in perfect health then you've truly been blessed.